Willie “Elizabeth” Martin of Richmond, Missouri, passed away at 4:35 a.m., Monday, September 24, 2018, at Saint Luke’s Hospice House in Kansas City, Missouri. Elizabeth lived fearlessly and was granted an earthly life of 92 years, and 4 days. It was on a Monday, September 20, 1926, in Hodge, Missouri, that the Lord blessed the home of George LeRoy and Alva Pearl (Harrington) Smith with the precious gift of a daughter. She had five siblings which made for a lively home of sibling connections and a few squabbles. Elizabeth attended Hodge School. Once she completed her primary education she began her life journey as the wife of Oren Jerome Martin, and to this union, they were blessed with eight children, LeRoy, Norman, Lonnie, Shellie Irene, Pamela Kay, Iva Denice, Milton Anthony, and baby Marie whom they lost in infancy. She remained in the home raising their children and was an excellent homemaker, quilting, crocheting and sewing her children’s clothing. She always had an abundant vegetable garden and canned the many provisions to nourish her family amply through the winter months. She provided childcare services for many local children when her children were still too young to attend school or barely of school age. After her children developed into adulthood, Elizabeth accepted employment with the Richmond R-XVI School District, using her skills doing what she loved best by taking care of children. She was confident in her abilities and prepared the students with their daily meals. She later began employment within the dietary department at a local nursing home facility. This area sparked an ambition by fulfilling the desire she had by caring for others and she began taking courses for a certification as a nurse assistant, accommodating the elderly in several nursing home facilities: Shirkey Nursing and Rehabilitation Center, Valley Manor, and Royal Care. Elizabeth planted a beautiful rose garden, reaping the rewards daily by taking the time to digest their essence and beauty. She thoroughly loved her pets, especially her cats and dogs. Elizabeth was an avid reader and she enjoyed the Catholic channel in the morning, and any channel showing a western in the afternoon or evenings, always favoring the Wagon Train series. She was a member of the Rayville Saddle Club and she believed in the Lord as her Savior and was a devout Catholic. 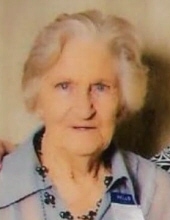 Elizabeth is survived by her loving children, Shellie Irene Cotner of Richmond, Pamela Kay Coyle of Richmond, Iva Denice (Mark) McGinnis of Hardin, and Milton Anthony (Becky) Martin of Orrick; 24 grandchildren, Donald, Tony, Sherri, Christi, John, Kathy, Cheryl, Lisa, George, Jerome, Melissa, Robert, Robert Carl, Michael, Jeff, Rebecca, James, Katherine, Sondra, Shellie, Shane, Virginia, Kasy, and Lucas; several great-grandchildren, and great-great-grandchildren; three sisters, Shellie Gerhart of Richmond, Mary Sylvia of Texas, and Carrie McGinnis of Richmond; a brother, Russell Smith and his wife Patti of Independence, Missouri; and several nieces and nephews. Elizabeth was preceded in death by her parents; her husband, Oren; the harrowing loss of three sons, Leroy Martin, Norman Martin, and Lonnie Martin; and sorrowfully the loss of an infant daughter, Marie; and a sister, Georgia Halstead. Memorial Services will be held on Friday, September 28, 2018, at 2:00 p.m. at Foster Funeral Chapels, Wavery, Missouri with Father Deva Gudime officiating. There will be a gathering of the family and friends to celebrate the life of Elizabeth, one hour prior to the service from 1:00 p.m. to 2:00 p.m., at the Waverly funeral chapel. As an expression of sympathy and in memory of Elizabeth, Memorial Contributions may be made to family’s choice. They may be left at or mailed to Foster Funeral Chapels, 201 South Main Street, Carrollton, Missouri, 64633. Serving the family, Foster Funeral Chapels, Carrollton, Missouri. Online Condolences may be left for the family on our website, www.fosterfuneralchapels.com or connect with them on our business Facebook page: Foster Family Funeral Chapel and Cremation Services, LLC. To send flowers or a remembrance gift to the family of Willie "Elizabeth" Martin, please visit our Tribute Store. "Email Address" would like to share the life celebration of Willie "Elizabeth" Martin. Click on the "link" to go to share a favorite memory or leave a condolence message for the family.